Kishore Biyani, Managing Director, Future Ventures India Ltd.
Future Ventures India Ltd (BSE: 533400, NSE: FUTUREVENT) counter in BSE on Wednesday witnessed a significant buy of over 1 crore shares by Future Corporate Resources Ltd. The deal was disclosed at Bombay Stock Exchange after trading hours on Wednesday. Future Corporate Resources bought 100.20 lakh shares at Rs. 8.50 a share, making the deal worth Rs. 8.52 crore. 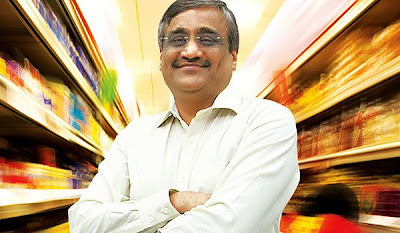 Though the buyer doesn’t figure currently as a prominent promoter holder in Future Ventures, it is a key company in Future Group, being one of the ten larger entities among the hundreds of companies through which Kishore Biyani’s business group operates. Future Corporate Resources is the largest holder in group’s flagship listed entity, Pantaloon Retail (India) Ltd, with a 39.10% stake, while Pantaloon is the largest holder in group’s second largest listed firm, Future Capital Holdings Ltd.
Wednesday’s buy amounts to a 0.64% stake in Future Ventures. There were no identifiable sellers offloading more than 0.50% stake on Wednesday. The promoter holding was 34.59% as of Q4 Share Holding Pattern, with the lead entity being Pantaloon Retail (India) Ltd, and the rest split between 4 other group firms. It is now not known whether Wednesday’s buy is any kind of restructuring within the group with any of these other firms selling less than 0.50% stake each which can be detected only by further mandatory disclosures in the coming days. Recently, a large restructuring along such lines had happened in Future Capital Holdings when Pantaloon Retail divested part of its stake to Future Value Retail. Such moves have become necessary as the flagship Pantaloon Retail has attracted significant investment from Aditya Birla Nuvo in lieu of hiving off a part of the company to the Birlas. However, if Wednesday’s buy by the promoters is not something along those lines, but a pure market buy for upping stake, this move has positive implications for Future Ventures. StockExplain had earlier reported on BNP Paribas Arbitrage acquiring 2.50 crore shares in the company at the same rate. On the fundamental side, however, Future Ventures is still struggling with its bottomline, with losses sharply up in FY’12. But revenue growth is intact, and the verdict on the stock as a large equity-base one with only long-term prospects on triggers like listing or demerger of its core operations like Indus League Clothing, is continuing. The company has recently upped its stake in Indus League. On Wednesday, Future Ventures India stock closed trade at Rs. 8.41, up by just 0.72%.